This study aims at finding the relationship between visual imagery ability and reading comprehension abiity in expository text. The participants for this study consisted from 186 students of all 5tti and 6tti grade elementary at Duren Sawit public elementary school 02 Pagi, East Jakarta . Data was obtained using constructed tests and processed with SPSS software version 13. Using Spearman Correlation, the result r(137) = 0.566, p < 0.01, showed that there's a positive relationship discovered between elementary student's visual imagery ability and their reading comprehension ability in expository text. 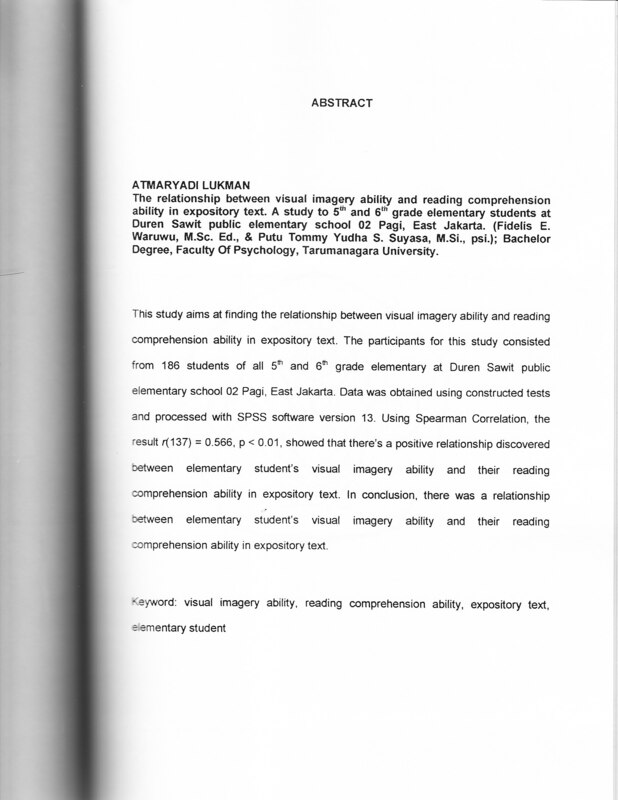 In conclusion, there was a relationship between elementary student's visual imagery ability and their reading comprehension ability in expository text.